Today, we are releasing Windows 10 Mobile Insider Preview Build 14283 to Windows Insiders in the Fast ring. As a reminder, we are initially making new mobile builds from our Development Branch available only to devices that shipped with Windows 10 Mobile. Currently this includes the Lumia 950, 950 XL, 650, 550, Xiaomi Mi4, and ALCATEL ONETOUCH Fierce XL. We plan to expand to other devices once we start releasing Windows 10 Mobile to other devices. If you are a Windows Insider on a device not mentioned above, you can stay in the Fast ring and sit tight until we expand to other devices or go back to Build 10586 and switch to the Release Preview ring to continue helping us test Cumulative Updates. For more information about our rings and branches, I highly recommend reading this post here in Insider Hub. For this build, we have some new things for you to check out and a lot of good improvements and fixes that Insiders will enjoy on their devices. We have addressed an issue where the background behind the All apps list would not have an overlay (causing it to appear too bright or too dark, depending on your background) if you went back to All apps list after launching an app. We fixed an issue causing the title of a song in volume control to flicker a few times when you pressed play or changed tracks after a pause. We fixed an issue some users were experiencing with Build 14267 where your device could hang while typing and reboot. 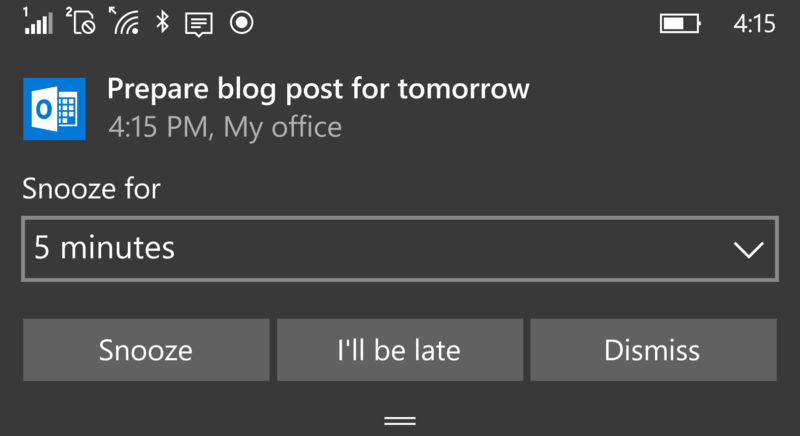 We made some more improvements to the Live tile refresh logic. First, if there are pending notifications for several Live tiles, we will now update them in one quick sweep across the Start screen rather than one at a time. Second, if a Live tile has both badge and content updates, they will now appear at the same time. Finally, apps will now launch faster from the Start screen if there are incoming Live tile updates at the same time. We fixed an issue where Live tiles for certain apps (such as the Weather app) would sometimes unexpectedly be cleared of active notifications. We fixed an issue in which the Start screen background would appear to stutter behind the tiles when scrolling up and down the Start screen on some devices such as the Lumia 950. We fixed an issue where the keyboard would sometimes pop up when swiping over to the All apps list. We fixed an issue where icons for certain apps would appear too tiny on Live folders on the Start screen if your phone was set to 350% DPI. We fixed an issue where “More notifications” message in Action Center was not properly formatted. We fixed an issue where for certain languages, pressing “@” button could result the contents of the clipboard being pasted. We fixed an issue where notifications using custom sounds would be silent if the underlying audio file had been deleted. Now, if that file is not present, it will play the default notification sound. As always – thank you for being Windows Insiders and make sure to send us feedback on any issues you run into with these builds in the Windows Feedback app.